Paris is famously romantic and magical in spring. It’s when trees bloom, with spring flowers in the city a dreamy vision. 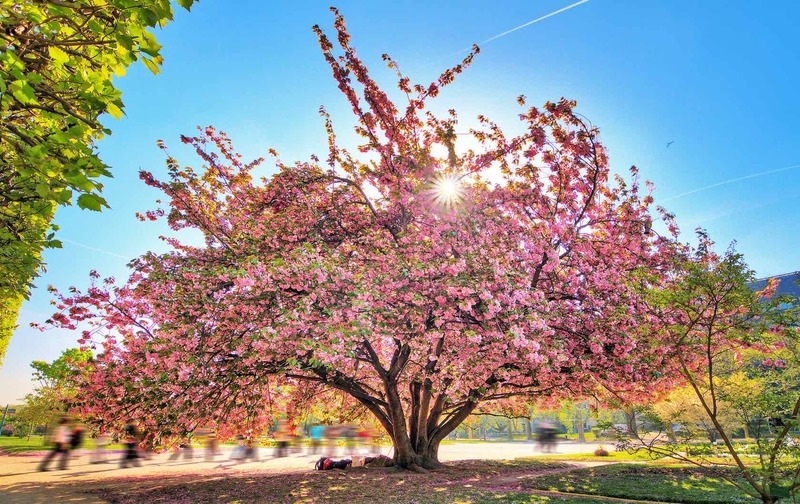 Flaunting white, cream and pink magnolias, yellow daffodils and pretty-in-pink cherry blossom, the season makes landmark sights even lovelier. Spring blossoms usually last from late-February to late April, offering plenty of chances to spot clouds of pink fluff. Even toward the end of the season, the effect is beautiful, with rosy petals raining down. 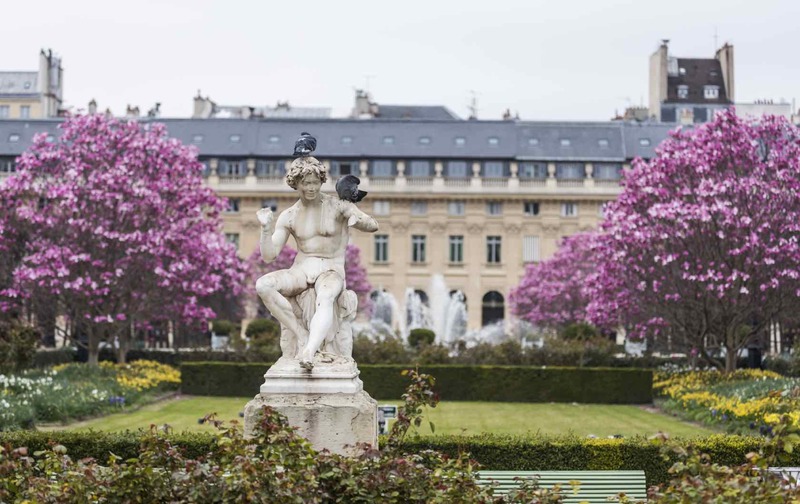 Promising warmer weather and longer days, spring is ideal for a Paris getaway. 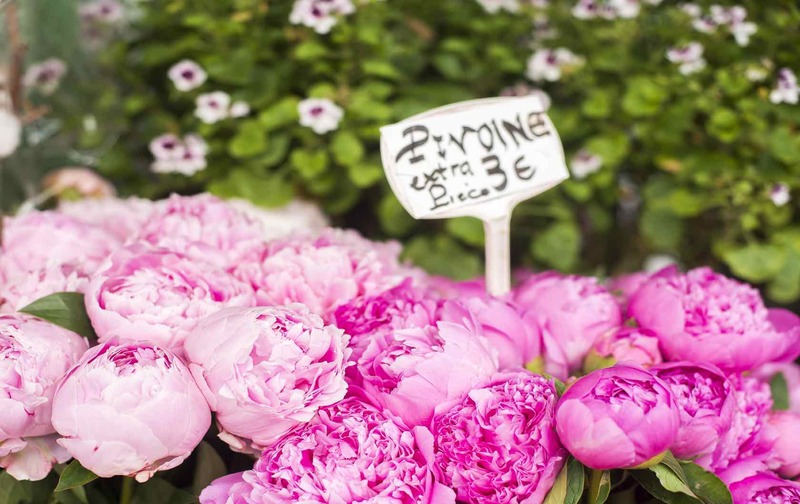 And, naturally, we’ve got stylish Paris Perfect vacation apartments near the best blooms. 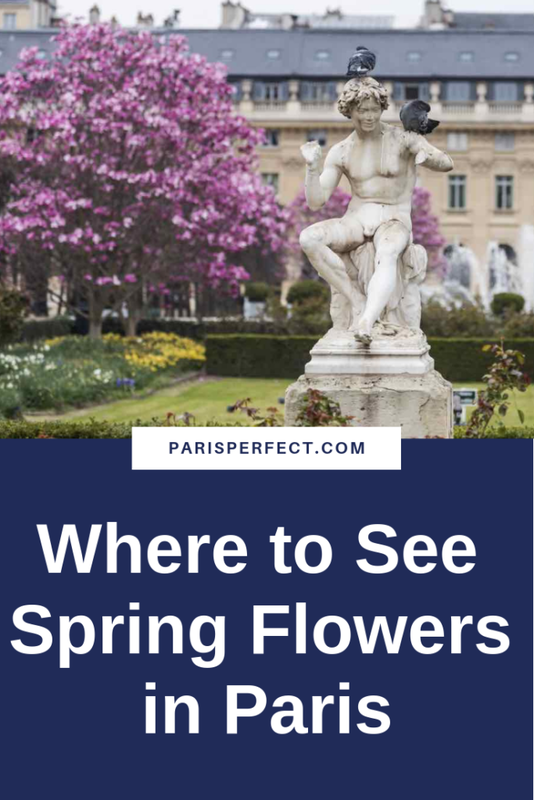 Here’s our guide to 10 top spots to see spring flowers in Paris. 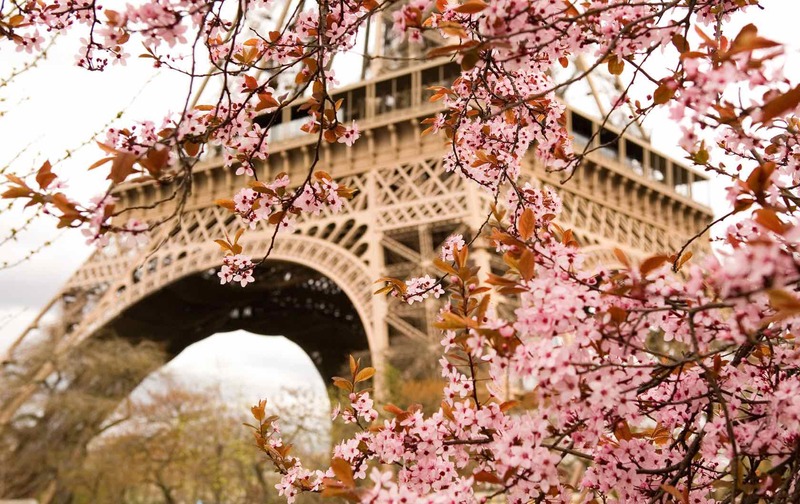 How do you beat a photo of the iconic Eiffel Tower framed by blossom? From late March, vast Parc du Champ-de-Mars facing the tower is filled with cherry blossom trees. Opened in 1780, the park’s verdant lawn is popular for picnics. Its blend of nature and architecture is especially stunning at sunrise or sunset. You’ll also get striking views of Eiffel from Jardins du Trocadéro, across Pont d’Iéna bridge, combining blossom and a cute carousel. Paris Perfect’s rental stays near Champ-de-Mars include the chic, three-bedroom Mâcon. French for “Town Hall,” central Hôtel de Ville de Paris is in the chic Marais quarter. This 19th-century neo-Renaissance-style building makes an impressive backdrop to spring flowers in Paris. Surrounded by delicate white blossoming trees and pink magnolias, it’s perfect for seductive snaps. Look for blooms in tiny adjacent park Jardin des Combattants Espagnols de la Nueve by the river, open at weekends. Look to the elegant two-bedroom Bel-Air apartment close to Hôtel de Ville. 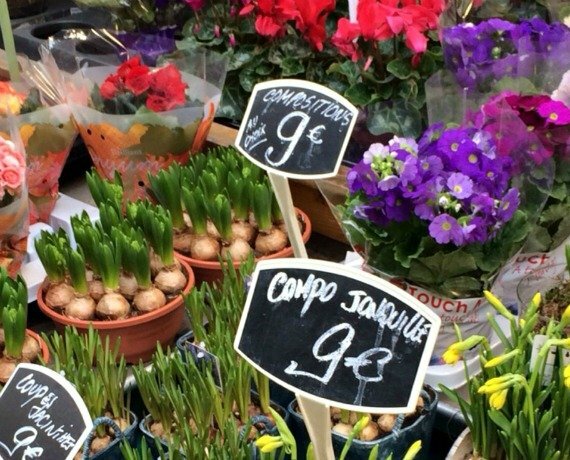 As one of Paris’ prettiest flower markets, Marché aux Fleurs is another top spot for seeing spring flowers. Near the Seine on the Île de la Cité, it’s between Notre-Dame Cathedral and Sainte-Chapelle chapel. Founded in 1830, with cast-iron pavilions added from 1900, it includes indoor and outdoor areas. 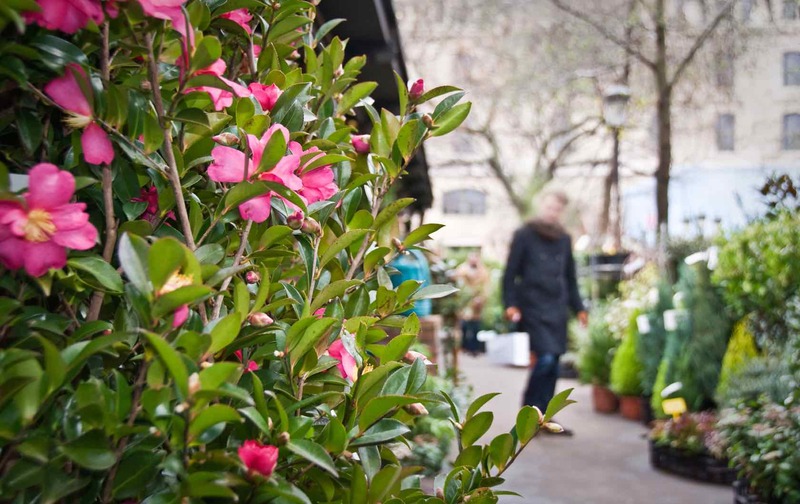 You’ll find bunches of spring flowers, plus exotic orchids, plants and shrubs. Close to the Cité Metro, it opens daily from 8am to 7.30pm, with a bird market on Sundays. Pick up some flowers to decorate your apartment at 25 Place Dauphine, just a brief walk from the market. 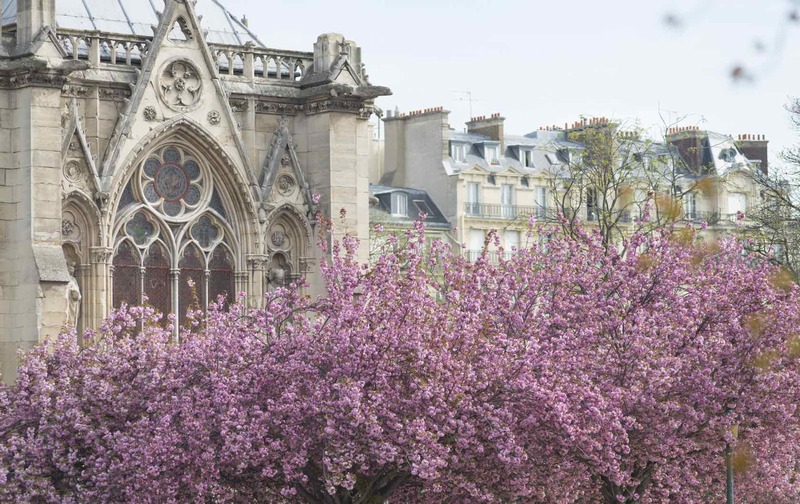 One of the best places to catch fluffy pink cherry blossoms in bloom is Square Jean XXIII just south of Notre-Dame Cathedral. This popular little park’s picturesque benches and sandbox add Parisian detail to your floral snaps. Arrive early for people-free pics. You’ll also get pleasing panoramas gazing from across the river. The cathedral is also near 25 Place Dauphine, which offers elegant one- or two-bedroom stays. Across from Notre-Dame on the Left Bank, a cluster of blossoming trees beckons outside Shakespeare and Company. Visit this charming English-language bookstore/café – which appeared in romantic movie Before Sunset – then capture shots of pink-tinged trees. They look breathtaking in the soft morning light against the store’s green facade. For more spring flowers in Paris, stroll to botanical gardens Jardin des Plantes on the Left Bank. You’ll spy magnificent pink-hued cherry blossoms backdropped by heritage architecture and landscaped grounds. The gardens also host a small zoo, natural history galleries and conservatories. Covered in delicate white blossoms, the gorgeous Prunus Sato Zakura Shirofugen cherry tree has enveloping branches that sweep to the ground; just ask the staff where to look. A skip from the Louvre, the classical 17th-century arcade Palais-Royal offers scenic spring flowers in Paris. Blossoming trees in its central courtyard garden are backdropped by arched colonnades and hedges with a bench-dotted park for picnicking. The early-blooming pink magnolia trees look fabulous fringed by yellow daffodils or roses. To soak up spring’s bounty, chill out on a café terrace. This tranquil oasis isn’t dubbed a “village in the city” for nothing! It’s worth the 20-minute train ride south of Paris to admire the amazing blossom orchard at Parc de Sceaux. A dramatic 19th-century château flanked by topiary bushes and manicured gardens, it boasts rows of flowering cherry trees. The 444-acre park, featuring an octagonal lake and canal, was designed by André Le Nôtre, who masterminded Versailles’ grounds. Visit mid-week or early morning for quieter times (closed Mondays) and pack a picnic. 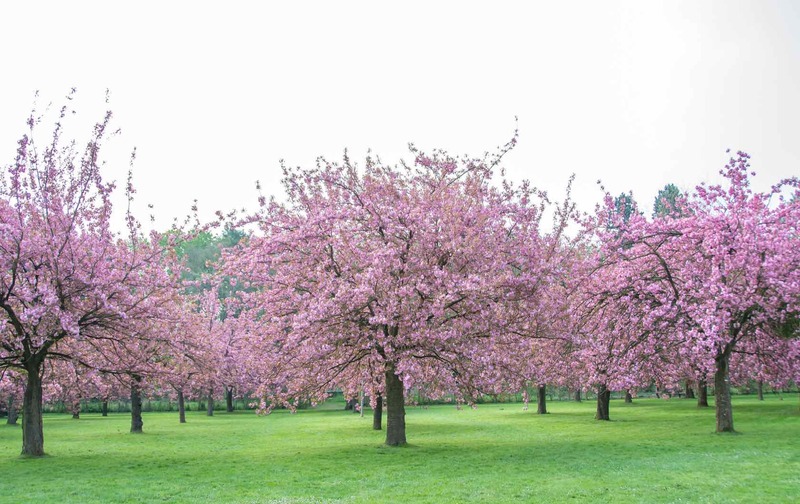 Easter guests can enjoy the Japanese Hanami cherry-blossom festival (20-21 April; book for Sunday). Take RER B line from Paris. 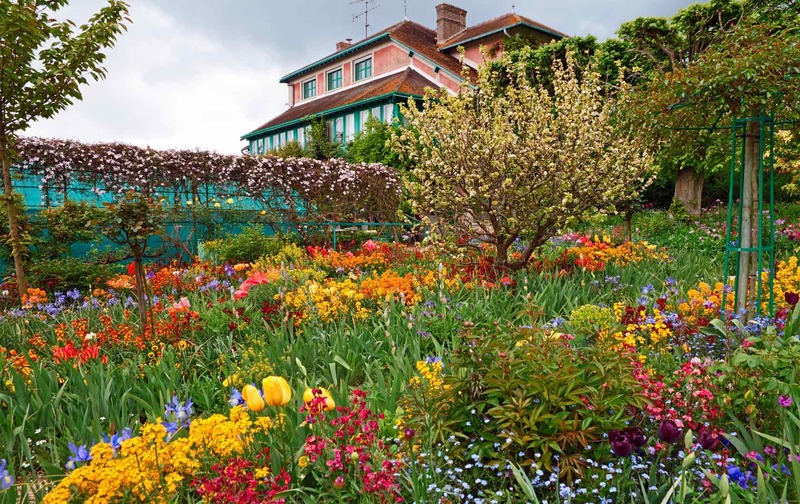 French Impressionist painter Claude Monet’s country house at Giverny is a wonderful place to see spring flowers. Just a 45-minute train ride from Paris, Fondation Claude Monet’s gardens are alive with vibrant tulips in April and May. Expect a rainbow of colors, from red to orange, yellow, pink and violet. 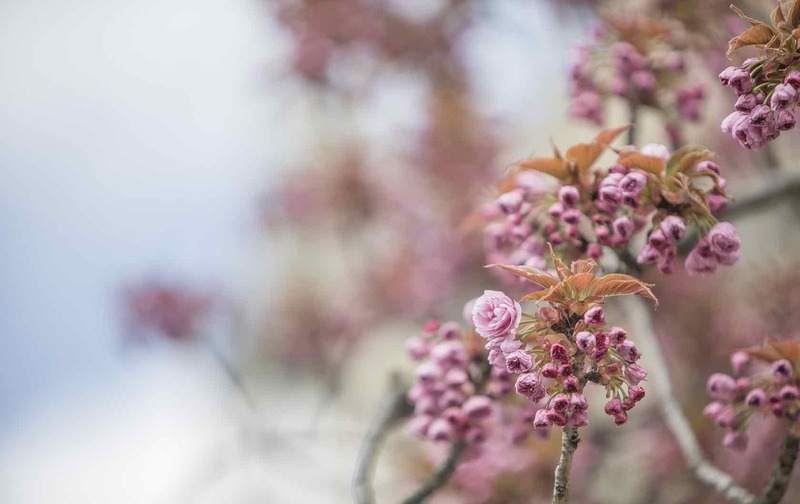 Other spring flowers include narcissi, daffodils, wallflowers, forget-me-nots, poppies, peonies and irises, with apple and cherry trees in blossom. Lily ponds and weeping willows add painterly charm. Catch a train from Gare Saint-Lazare to Vernon, then the shuttle bus to the gardens. Rain stopped playing outdoors? 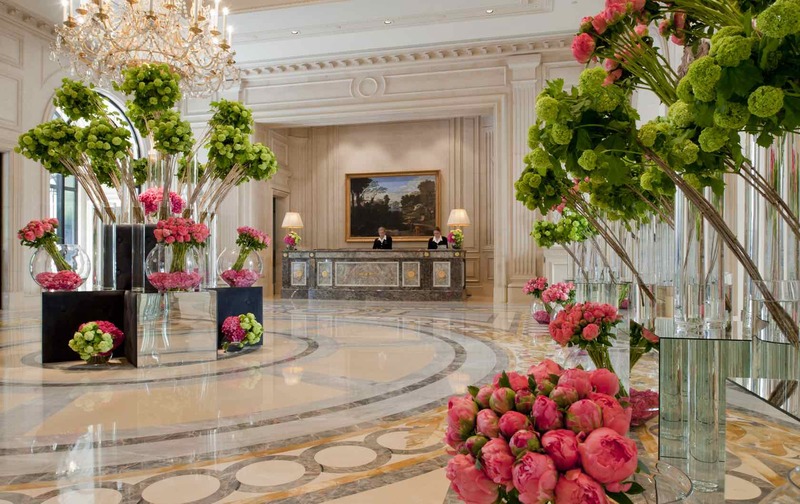 You can still discover fantastic flowers in the lobby and dining rooms of the Four Seasons Hotel George V. American rock star florist Jeff Leatham, the hotel’s artistic director, is famous for his sculptural floral arrangements, with a cult following including royalty and Oprah. Expect big displays of stellar spring and exotic blooms. To admire them why not book afternoon tea at opulent all-day lounge La Galerie, or sip cocktails in the courtyard? If Paris in the springtime (or anytime, really) is on your mind, give our reservation team a call at 1-888-520-2087 from the USA or email [email protected]. Posted on Tuesday, April 2nd, 2019 at 3:42 pm in Paris Tips. You can follow any responses to this entry through the RSS 2.0 feed. You can skip to the end and leave a response. Pinging is currently not allowed.